This article is about the section of Interstate 95 in Massachusetts. For the entire route, see Interstate 95. Interstate 95 (I-95) is a part of the Interstate Highway System that parallels the East Coast of the United States from Houlton, Maine in the north to Miami, Florida in the south. In the U.S. state of Massachusetts, it spans 92 miles (148 km) along a south–north axis. It is the third-longest Interstate Highway in Massachusetts, behind I-90 (the Massachusetts Turnpike) and I-495, while I-95 in full is the longest north–south interstate, and sixth-longest Interstate Highway in the United States. It southern terminus within the state is located in Attleboro, where I-95 enters from Pawtucket, Rhode Island. It intersects with US 1 and the northern terminus of I-295 within Attleboro, I-495 in Mansfield, and US 1 in Sharon before arriving at an interchange with I-93, US 1, and Route 128 in Canton. At this interchange, I-95 begins running concurrently with US 1 and Route 128 along a beltway roughly 15 miles (24 km) outside of Boston. While its concurrency with US 1 ends in Dedham, its concurrency with Route 128 continues as it meets with expressways including the Massachusetts Turnpike in Weston, US 20 in Waltham, Route 2 in Lexington, US 3 in Burlington (with which it runs concurrently within the town), and I-93 and US 1 in Reading and Lynnfield, respectively. I-95 and Route 128 split in Peabody, as Route 128 travels north-east towards its northern terminus in Gloucester, I-95 continues north and crosses with US 1 in Peabody and Danvers. Within Salisbury, it intersects the northern terminus of I-495 and arrives at its own northern terminus, where I-95 continues into Seabrook, New Hampshire as the Blue Star Turnpike. I-95 crosses the state border from Pawtucket, Rhode Island into Attleboro as a six-lane highway, with the first northbound exits, 2A and 2B, providing access to Route 1A and nearby U.S. Route 1 near the border. (There is an Exit 1, but it is a southbound-only exit connecting to US-1 south into Rhode Island.) Exits 3–5 also serve the Attleboro area, with Exit 4 at the northern terminus of Interstate 295. Exits 6A and 6B in Mansfield provide access to Interstate 495, the "outer circumferential" beltway around metro Boston. I-495 provides northbound connections to Worcester, the Massachusetts Turnpike, and the western part of the state, and southbound connections to Cape Cod. Mansfield is home to the Comcast Center, a Live Nation-owned amphitheatre that hosts numerous concert events, and the TPC Boston, a PGA player's club that hosts the Deutsche Bank Championship yearly. The two venues are located near I-95's interchanges with Route 140. I-95 continues northward into Foxborough, home of Gillette Stadium, located on US-1 and accessible from Exit 9. The interstate continues through Sharon, it then enters the metro Boston area and the towns of Walpole, and Norwood, before entering Canton, where it meets Interstate 93 at its southern terminus (Exit 12), and Interstate 93 continues as Exit 12 to the right of I-95, while I-95 traffic is routed in a single lane to a sharp clockwise curve where it meets U.S. Route 1 in a wrong-way concurrency. Note: For motorists traveling on I-95 southbound, Exit 12 is designated as the two left-most lanes, while I-95 southbound is designated as the two right-most lanes. Upon interchanging with I-93, I-95 loops around to the west, taking over the roadbed from I-93 and joining US-1 southbound in a wrong-way concurrency. Route 128 begins here as well. The highway enters Westwood next, with US-1 leaving the freeway near the Dedham town line (at Exit 15B) to parallel I-95 back to the south. I-95 and Route 128 makes its way around metro Boston, passing through Dedham, Needham, and Wellesley, where the freeway has an interchange with Route 9 at Exit 20, and the freeway widens to eight lanes. Then the highway passes through Newton, then enters Weston and has a large interchange with the Massachusetts Turnpike (I-90, at Exit 25) that provides connections to nearby Route 30. There is a fourth lane after the interchange with Rt 9. Exits 23, 24, and 25 are one combined exit northbound. I-95 and Route 128 are due west of Boston at this point and begin to turn to the northeast, serving the city of Waltham and the town of Lexington along the way. The freeway has an interchange with Route 2 (Concord Turnpike) at Exit 29. Upon entering the town of Burlington, I-95 and Route 128 have an interchange with U.S. Route 3, the Northwestern Expressway, at Exit 32A. US-3 provides a direct freeway connection with the Lowell and Nashua, New Hampshire metro areas. Access to the Middlesex Turnpike and Burlington retail district is facilitated at this interchange as well. US-3 south briefly joins the freeway in another wrong-way multiplex in order to connect with its old alignment, leaving at Exit 33A. I-95 and Route 128 continue northeast through the city of Woburn and into Reading. In Reading, I-95 and Route 128 once again have an interchange with I-93. After crossing, I-93, the now six-lane highway continues to the northeast, serving the towns of Wakefield, Lynnfield, and Lynn before crossing into Peabody, where Route 128 leaves I-95 at Exit 45 via the three left-most lanes as its own freeway towards Gloucester, while I-95 continues as the two right-most lanes in a somewhat sharp counter-clockwise (albeit the fact that it contains two lanes) loop. Here, six lanes are designated for Route 128, while four lanes are designated for I-95. Note: On I-95 southbound entering the concurrency with Route 128 in Peabody, motorists must switch from the right-most two lanes still designated as I-95 to any of the three left-most lanes, which are designated as I-95 and also Route 128; otherwise, they will effectively exit at Exit 44. After leaving Route 128, I-95 expands back to six lanes and then to eight lanes at the partial interchange with US 1 (Exit 46) about 1 mile north of Route 128 and heads north through the less densely populated northeastern portion of the state. The freeway serves the communities of Danvers, Boxford, Georgetown, Rowley, Newbury, West Newbury, Newburyport, Amesbury, and Salisbury. Traffic density is generally low on this 25-mile (40 km) stretch of freeway. I-495 has its northern terminus at I-95 Exit 59 just south of the New Hampshire state line, a Y-interchange that merges I-495 onto I-95. Northbound access to I-495 south is possible via Exit 58 for Route 110 westbound, which leads to I-495's Exit 55 (I-495's last exit before I-95). The northernmost exit in Massachusetts is Exit 60, providing access to Main Street towards Amesbury and Route 286 towards Salisbury Beach and Hampton Beach (the southbound ramp starts in New Hampshire). After crossing underneath the connecting roads, I-95 crosses the state line into Seabrook, New Hampshire. The original plans called for I-95 to run through downtown Boston. 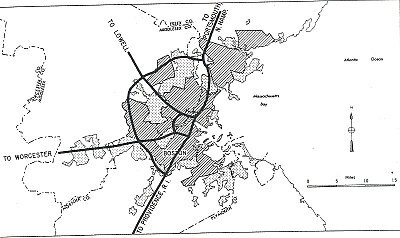 The highway would have progressed from Route 128 and Readville, followed the Southwest Corridor, joined the Inner Belt in Roxbury, heading east, and joining the Southeast Expressway at South Bay, then north to the Central Artery at the South Station interchange with the Massachusetts Turnpike/Interstate 90, and connecting with the Northeast Expressway at the Charlestown banks of the Charles River. However, due to pressure from local residents, all proposed Interstate Highways within Route 128 were canceled in 1972 by Governor Francis Sargent with the exception of Interstate 93 to Boston. The only sections of I-95 completed within the Route 128 beltway by the Massachusetts Department of Transportation were the segment known as the Northeast Expressway north from Charlestown to Saugus, which is now part of U.S. Route 1, and the Central Artery, which cut the North End neighborhood from downtown Boston proper until the Big Dig essentially submerged the old Central Artery's traffic load below ground level in 2003. The Southwest Expressway and the Inner Belt highways were among the Sargent-canceled highways. Original 1955 Yellow Book plan showing the southwestern routing of I-95 to the Inner Belt. The modern I-95 follows the outer belt shown on this map (now considered the "inner" Route 128 compared to the "outer" I-495 which is not shown, and which started construction 2 years after the study). Between 1972 and 1974, plans were to extend I-95 along a northerly extension of the Northeast Expressway to Route 128 in northwestern Danvers. During this time, I-95 was officially routed along Route 128 from Canton to Braintree and north along the Southeast Expressway (also designated Route 3), from Braintree to Boston, then following the Central Artery, and continuing along the Northeast Expressway in Boston, Chelsea and Revere. When the Northeast Expressway extension (between Saugus and Danvers) was canceled in 1974, I-95's route shifted to its current routing along the perimeter highway (Route 128) and I-93 was extended to meet I-95 in Canton. For several decades, plans for the abandoned roadways could still be seen going from the end of the Northeast Expressway to the Saugus River in Saugus in the form of a graded but unpaved roadbed. Much of this was removed during the early 2000s. At the US 1/Route 60 interchange, one can still see unused bridges and ghost ramps that were originally intended to carry I-95. All interchanges were to be renumbered to mileage-based numbers under a project scheduled to start in 2016, however this project has been indefinitely postponed. 57.502 - 19A Kendrick Street – Needham Opened on December 1, 2017 as part of the Add-A-Lane project. 60.721 56 19B-C Highland Avenue – Newton Highlands, Needham Signed as exits 19B (Newton Highlands) and 19C (Needham). Formerly signed as exits 19A and 19B. This is a list of rest areas on Interstate 95 in Massachusetts. Mansfield Rest Area — MP 10 - Northbound only between exits 5 and 6 -portable restrooms, phones, picnic area. North Attleborough Parking Area — MP 10 - Southbound only between exits 6 and 5 - Parking area, phones. Westwood Rest area — MP 29 - Southbound only between exits 14 and 13 - Rest rooms, Phones, Picnic Area. Dedham Truck turnout — Southbound only between exits 17 and 16 - Parking only, no facilities. Newton Service Plaza — Southbound only near exit 21; 24-hour food and fuel with McDonald's, & Honey Dew Donuts. Lexington Service Plaza — Northbound only near exit 30 - 24-hour food and fuel with McDonald's, Honey Dew Donuts, & Original Pizza of Boston. Massachusetts Visitor Center — MP 90 - Southbound only at the New Hampshire state line (exit 60)- Tourist info, restrooms, phones. NB and SB in Attleboro between exits 2 and 3. NB and SB in Rowley between exits 54 and 55. Between the Rhode Island state line and I-93 in Canton, and again between the northern end of the beltway and the New Hampshire state line, the speed limit is 65 MPH. The sharp transition curve from I-95 north onto the Route 128 beltway in Canton is posted for 25 MPH. Along the beltway the speed limit is 55 MPH, and the speed limit on the transition ramps at Exit 45 at the I-95/Route 128 split in Peabody is 45 MPH. ^ "Route 60 Plaza". Retrieved February 8, 2019 – via Google Maps. ^ Commonwealth of Massachusetts (2015). "COMMBUYS - Bid Solicitation FAP# HSIP-002S(874) Exit Signage Conversion to Milepost-Based Numbering System along Various Interstates, Routes and the Lowell Connector". Retrieved September 17, 2015. ^ Bob Malme (2016). "Massachusetts Interstate Highways Exit Lists". Retrieved October 19, 2016. ^ a b MassDOT Planning Division. "Massachusetts Route Log Application". Massachusetts Department of Transportation. Retrieved August 23, 2014. ^ a b Massachusetts Department of Transportation. "Exit Numbers and Names: Route I-95 (Attleboro-Canton)". Retrieved August 23, 2014. ^ a b Massachusetts Department of Transportation. "Exit Numbers and Names: Route I-95 (128) (Canton-Peabody)". Retrieved August 23, 2014. ^ a b Massachusetts Department of Transportation. "Exit Numbers and Names: Route I-95 (Peabody-Salisbury)". Retrieved August 23, 2014. ^ Google Maps (September 2013). "Street View". Google. Retrieved August 23, 2014. ^ Google Maps (October 2012). "Street View". Google. Retrieved August 23, 2014. ^ Google Maps (September 2012). "Street View". Google. Retrieved August 23, 2014. ^ Massachusetts Department of Transportation (2015). "Needham-Wellesley I-95 Add-A-Lane Project". Retrieved September 17, 2015. ^ Massachusetts Department of Transportation (2015). "Whittier Bridge/I-95 Improvements". Retrieved September 17, 2015.